0530 get alarm call from reception. 0550 get into taxi. 0620 I have checked in and cleared security. Given how paranoid they are, this has to be something of a record. Stop off at Chanel but they don’t stock Pour Monsieur and what they do have is more expensive than London prices. Make do with a litre of Tanqueray Traveller’s which turns out to cost less than the marked shelf price! Breakfast is an insipid coffee and a large slice of good lemon cake. Sit staring out at early morning misty airport. Thoughts go back to our first trip here in 99 when Jaipur was fog bound and we had a nightmare trying to get back to Goa for our return flight. “I’ll phone the manager” After a long explanation I can catch amongst the hindi phrases like 25% so I guess he is giving her a way round the system failure. She puts the phone down and starts making an espresso at which point mistertubby manager appears to check on her. She hands me a largish espresso, saying “double shot” and has even warmed up the bun. She relieves me of all 265/-which seems an entirely satisfactory result. Boarding is so slow I have plenty of time to consume my ill-gotten gains. Takeoff is only 15 minutes late but after half an hour it feels an awful long way to Heathrow. Somehow it passes. I finish the last 150 pages of the Jo Nesbo – “The Son” and watch a play I downloaded before leaving about a New Year’s Eve family gathering in a castle in Dorset called “Colin Bursted”. It’s entertaining for 90 minutes and enlivened by Charles Dance’s cameo as a transvestite beloved uncle. Time passes and eventually we land after being stacked for 15 minutes. Oddly the plane is about to Dock when they appear to move it to another gate which takes 10 minutes. So from a scheduled 15 minute early landing we are now 20 minutes behind. Having only a small rucksack I get to passport control ahead of the crowd and am straight through without waiting. The bags start to come off but it is 20 minutes before mine appears. The coach leaves at 3.30. A one stop to terminal 2 and a longish walk get me to the coach station by 3.05 in time to put on shoes and socks and a sweater. The coach leaves on the dot. Staring out at grey skies and greenish fields, it is hard to register the so sudden change. Only this morning I was in Mumbai. The cold is refreshing and it’s not raining. The coach arrives virtually on time in Sidwell Street and a 57 is soon rushing headlong towards Exmouth. At this time of day no traffic means 30 minutes. Striding up Fore Street with the rucksack on brings home that whatever the state of the rest of my body, my legs are currently in pretty good nick. After the turmoil of weekdays previously Sunday seems oddly quiet. Taking the train from Vile Parle to Byculla is less crowded than Exmouth to Exeter and a damn sight cheaper – 10/- for the 30 minute ride. Its certainly the fastest way to get around. I arrive at Dr Lad museum 5 minutes late for the English guided tour but catch up with them without any todo. 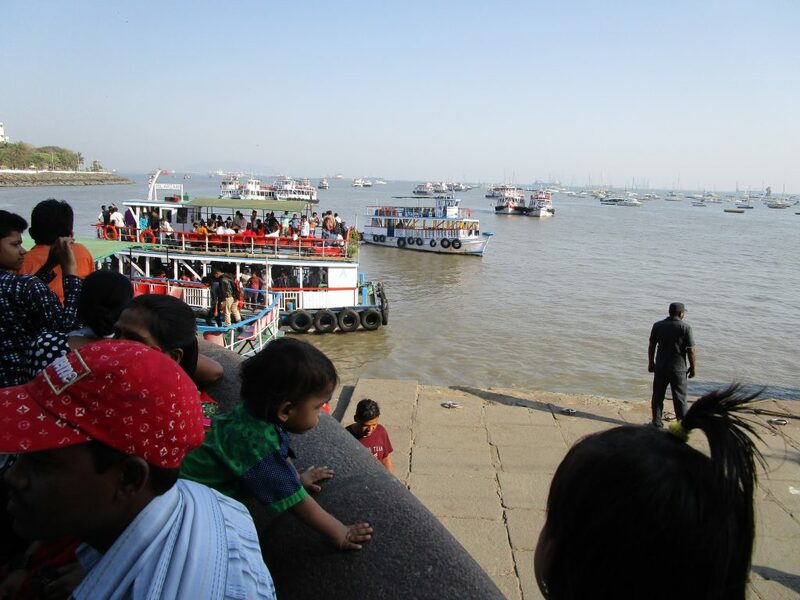 A boy of about 25 is giving a very well-spoken exposition of Mumbai’s history to a group of a dozen Indians. It is very pukka to speak English to fellow countrymen, shows you have class and standards. Rather like the Russian court speaking only French. The girl with him is similar and she does the artistic stuff. Unfortunately her voice is barely audible. 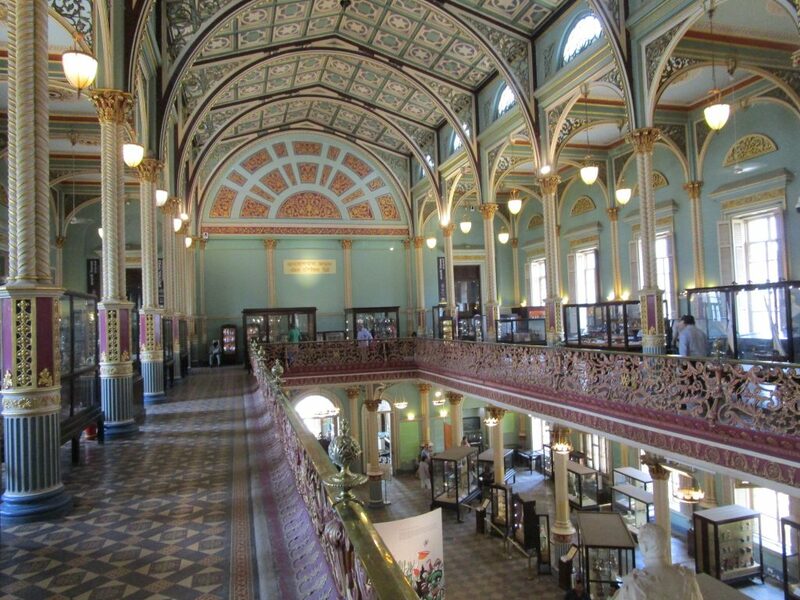 The place was originally built mid-19th century and called V&A. You can see why. 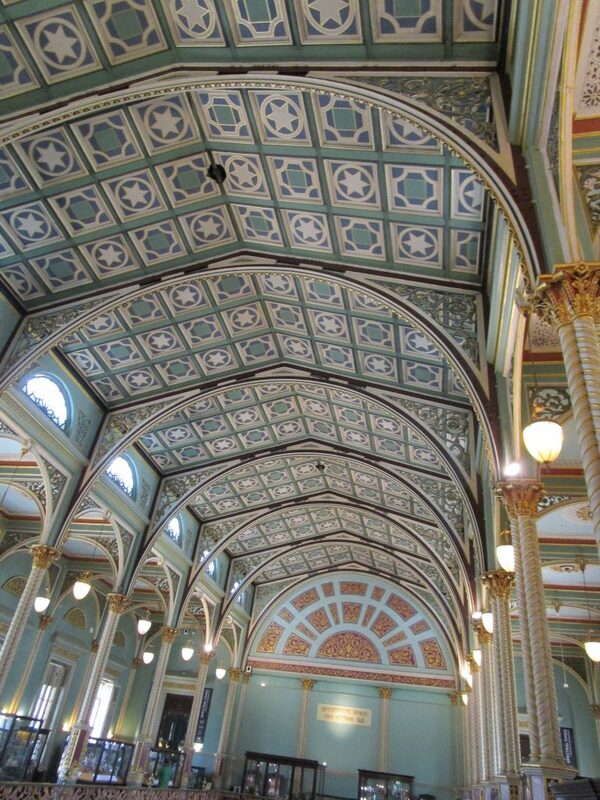 The ceiling reflects the original benefactor, David Sassoon an Iranian jew who came in exile in the early 19th century. Judging by some of the Pottery, the Art school that was set up in conjunction was highly sophisticated and developed. 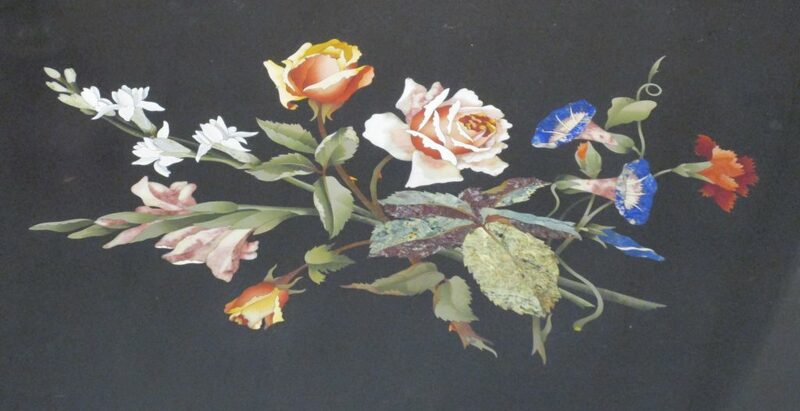 Obvious strong influences from William de Morgan and Morris. The boy’s recital of the geographical development throws up strong parallels with Venice. Islands set close together in marshy swamp, developed by reclamation and infill gradually until contiguous and all driven by commerce, first the Portuguese, Dutch and of course finally the East India Co. They reckoned the life expectancy for young officers was maybe two years. It was a disease-ridden hole. 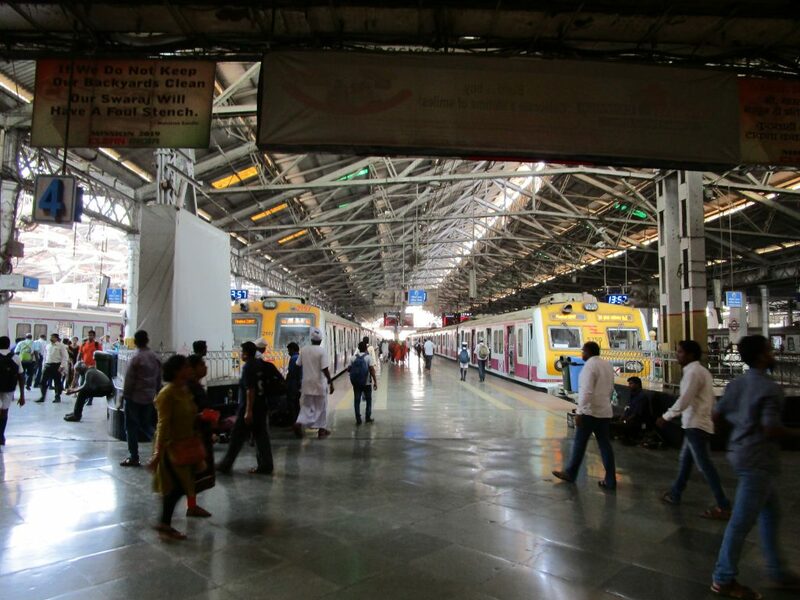 Some last minute shopping after a further 5/- ride down to CST at the end of the line is limited by most markets being closed on a Sunday. You are so accustomed to the endless retail that you forget to make allowance. An hour sitting on the Quay in the shadow of the Arch watching the hordes taking boat rides out into the harbour. And then a return to Delhi Darbar where we had had a fine meal at the beginning of all this. It was again good and the waiter Tashrique, even remembered me! 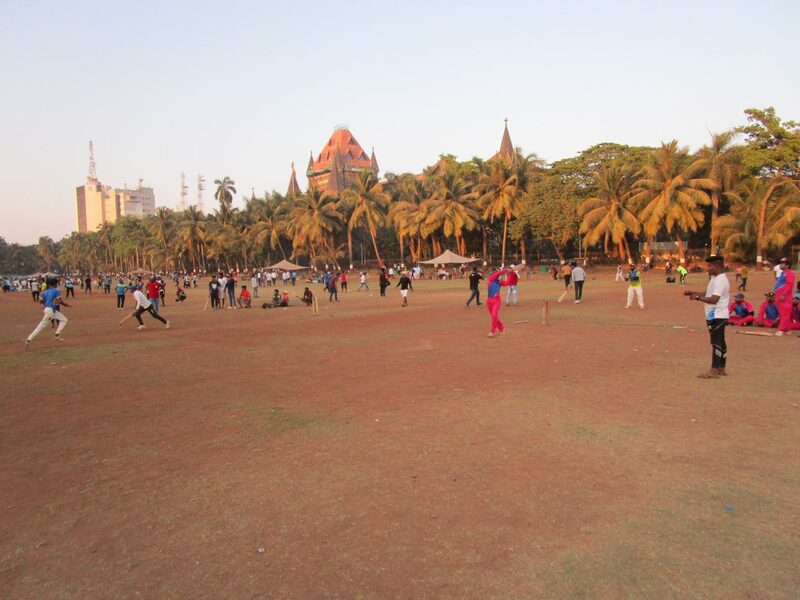 Walking back to Churchgate station I passed the big maidan where we played that first fraught game. It was complete chaos games cheek by jowl and balls flying everywhere. Most of the bowling was chucking and the batsman very wristy well-timed hits in the air in the Vee. But then there would be fielders scattered out there taking amazing running catches. The train this time back to Vile Parle is suddenly different, packed solid as only Mumbai can be. I manage to ease onto the correct side for exiting eventually and am back after a classic sort of day. Time now for a final shower and packing. 5 o’clock up and ready for taxi to airport. Road is empty and 35kms takes barely 30 minutes. Rather be waiting at the airport. Security check in very slow. Supposed to be an international airport but only two scanners and the operator on one is barely awake! Find a proper coffee bar and partake of American and large muffin. Plane takes off on time and lands ditto. Prepaid taxi has no idea where hotel is and. drives around for ages asking people. One bloke he asks tells me it is only 5 minutes walk away! Point out I’m in a taxi. It’s air-conditioned in the lobby and booked in without any trouble. Rooms a bit scruffy but clean and only two nights. WiFi is very good. A tuktuk takes me to nearby Juhu beach which is long and open sand. Being Saturday there are lots of families out. No swimming costumes but some are frolicking in the water still dressed. Walking North it soon becomes deserted though there is a couple of beach cafes where I get a drink and sit and read for a while. Getting back is a struggle. Quite a few won’t even consider going to Vile Parle and others want two or three times the rate. I don’t mind paying 20 or 30 over the odds for being white but when they say 200 instead of 60 I get fed up. There is an Ibis 5 minutes walk from the hotel so I take the easy option. Apart from the prices it’s OK, and chicken soft noodles is actually very tasty. And when the bill comes the young waiter has given me a 25% discount! I had considered staying there but even with the Accord membership it was still more expensive than in England so I didn’t bother. I have been able to check in and print boarding card which suggests mine is not one of their cancelled flights. Still looking like they are going down the pan this year. I manage to find an agreeable tuktuk driver who is not surly and who will take me there and wait to bring me back. On a hilltop outside the current city, it would have dominated the area and been virtually impregnable. There were diamonds mines here a long time ago and apparently the word itself has its own meaning in the diamond industry for quality.
. . . A clever piece of acoustical design creates a huge echo inside the gatehouse that would travel a mile away to an outcrop lookout post. Everyone visiting seemed determined to try it out. It quickly becomes apparent that the usual rules apply, ie all the most interesting bits are padlocked and barred, in this case the Masjid and the main durbar Hall. The site as a whole has been stripped bare down to its bare bones. Signage is almost non-existent and any hope of a reconstruction virtually nil. Tour guides are everywhere but their English is bad and they are barely comprehensible. Four Koreans give up after about three minutes. None of them wears any kind of badge or tourist board approval. And £12 an hour is pretty steep. There is no attempt at a reconstruction or renovation, it’s all bare rocks straggly steps and piles of building rubble. Hindi syndrome again? 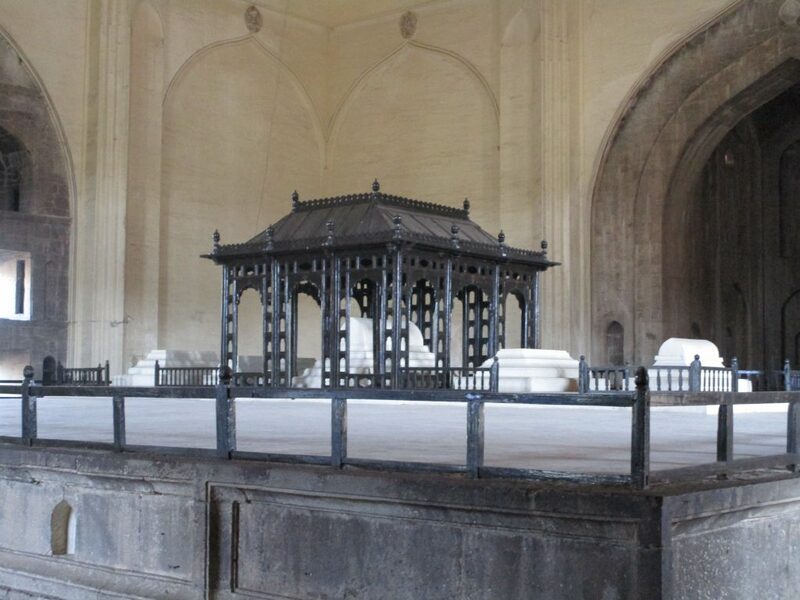 The best bits are bolted and padlocked – the Masjid, the Durbar Hall right at the top of the site. The view from here was worth the climb in the full blaze of the day. Close up the gardens are not so alluring. They lack one all pervasive feature, the water. A store room was converted to an enormous single cell to incarcerate a disgraced Court official. He was there so long he had time to create these carvings. Overall a fascinating site whose potential remains unexploited. Tuktuk driver turns up on the dot and we head back. The evening brings a return to Paradise, though this time soft Chinese noodles chicken and vegetables. Soothing in the style of Tye Pye Pong. No reason to tarry over breakfast and arrive at the museum ahead of crowds. A modern building by local standards. The opening rooms are very much devoted to the generations of Jung who created the collection and then donated it to the State. He was clearly a pearl fan. 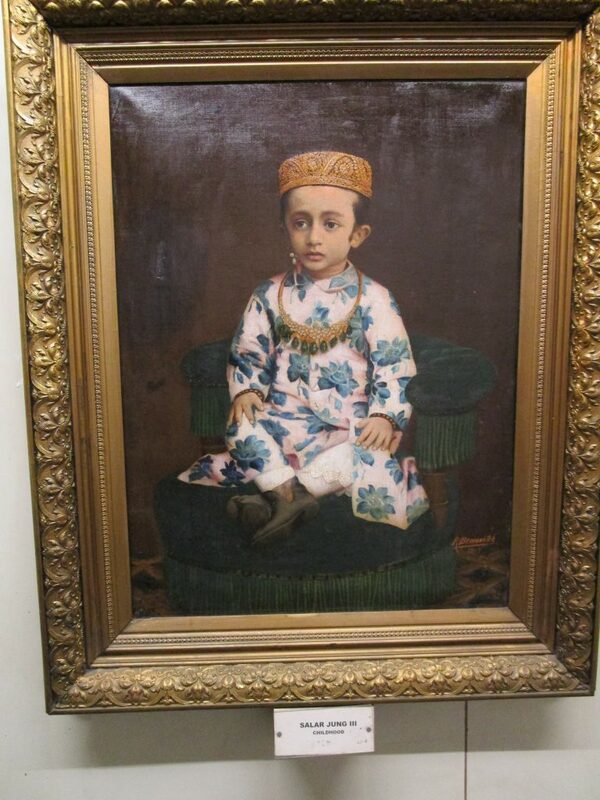 But there are earlier images of him as a child, on horseback or just sitting, which show a rather forlorn figure. 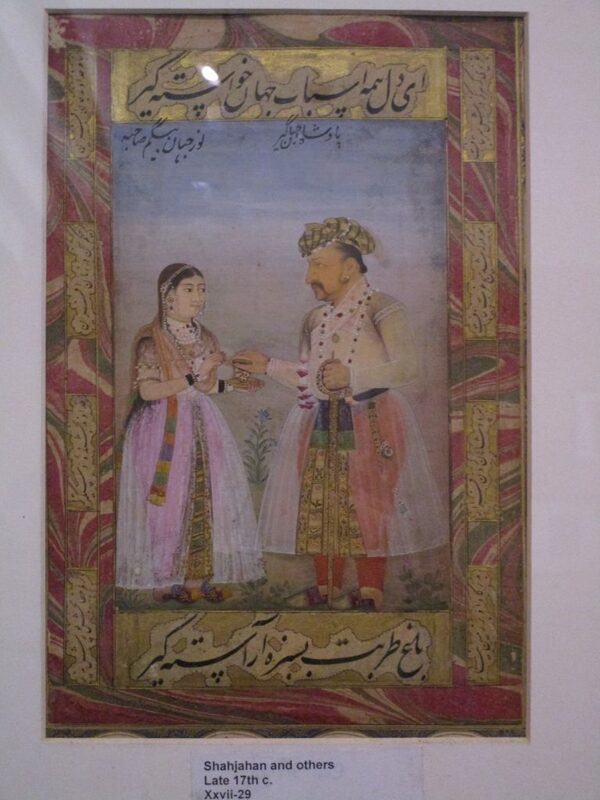 There ia an extensive collection of miniature paintings laid out by schools with God explanations. 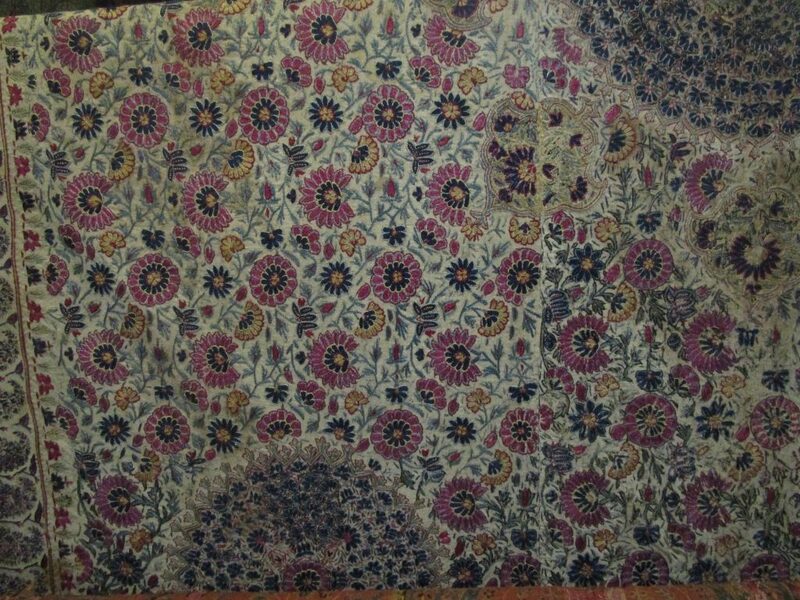 And some of the (Persian) carpets and the textiles are very fine quality. 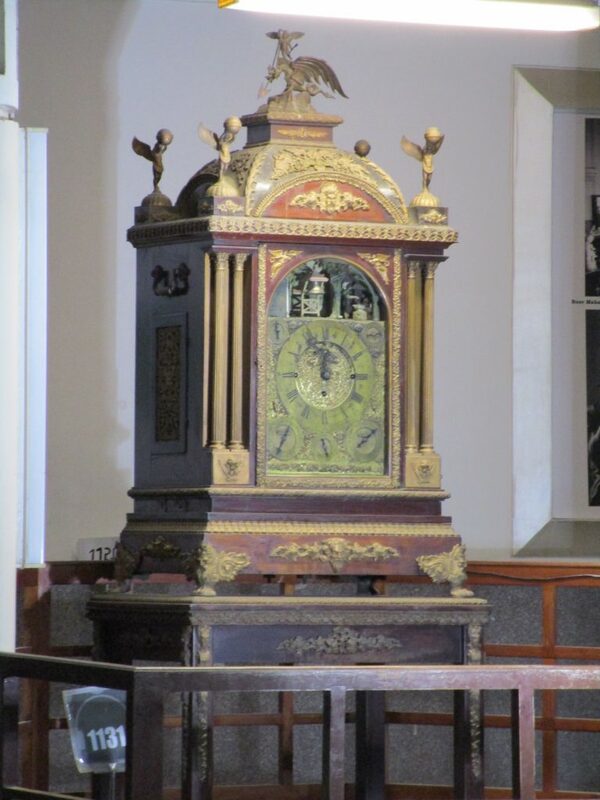 What I at first took to be a lecture hall was in fact the waiting room for a large clock to chime. It was hardly as impressive as you might expect from the size and enthusiasm of the attendant crowd. This was the first museum where exhibits were clearly and fully labelled, the infrastructure maintained and the lighting adequate. After a samosa and a banana I felt adequately prepared for a second bout of jewellers to try and find suitable pearls. So far have drawn a blank. 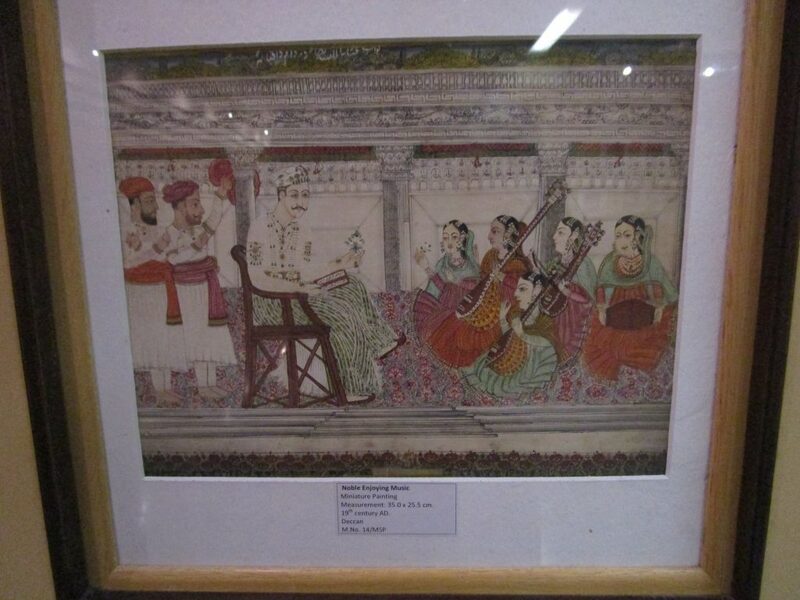 Whilst walking near Char Minar I hear this rhythmic multitone banging which I track down to a small shop tucked away. 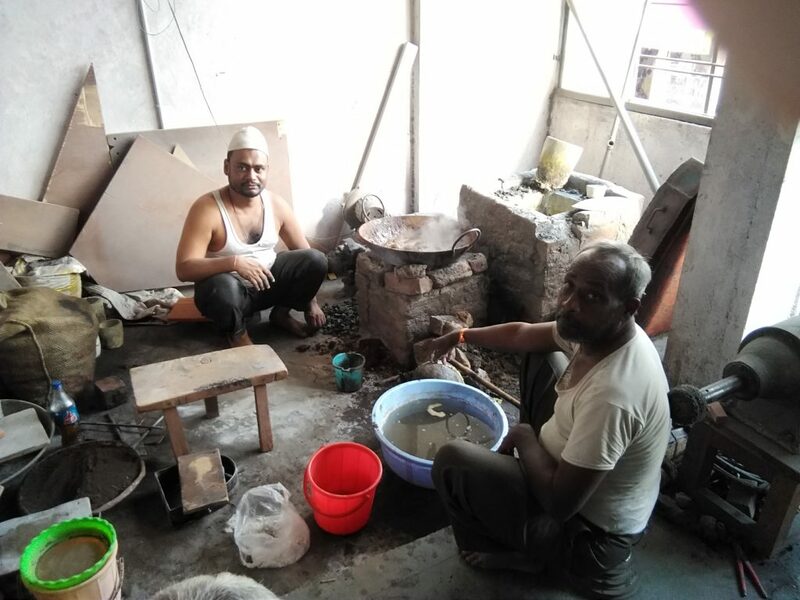 Men are beating out sheets of silver foil to be used in cooking. Another is packing it into sealed sleeves. He gives permission for a photo. It must be hard work using maybe 1lb hammers all day. I am recommended Paradise as the place to go for biriani. Turns out to be not so far away. 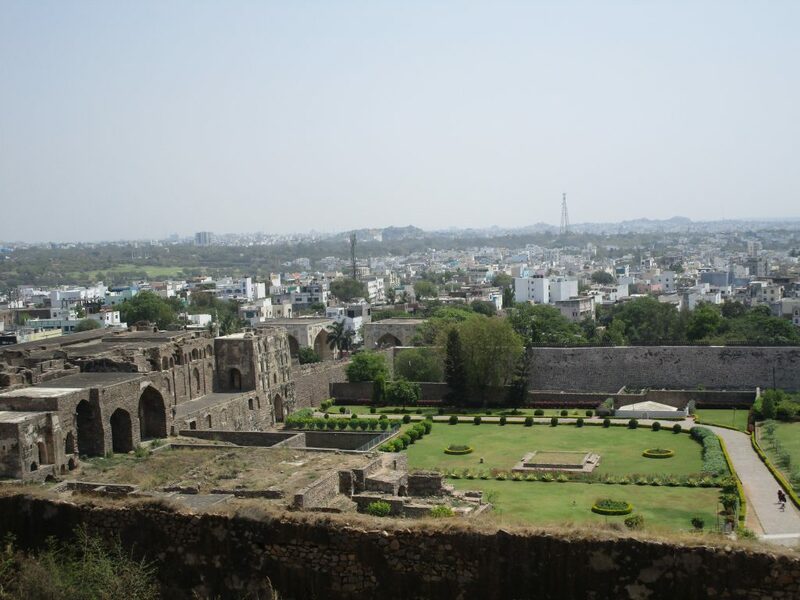 Also my source tells me that contrary to what others have said, Golconda Fort is open tomorrow despite being a Friday. I had been feeling frustrated up to then at missing it. Back at the hotel, writing up the blog is agonising as WiFi is so slow and sporadic. The biriani in Paradise is better than Bawarchi the night before but there is a lot of rice and the chicken has been cooked almost to oblivion. The sweetcorn soup I enjoy though, Chinese style with egg poached in it. Breakfast brings a sharp reality check after last night. It is really bad, even by Indian standards. Unripe fruit. Marginally stale bread for toasting in an antique machine where only some of the slots work! Brown liquid masquerading as coffee. No eggs because ” pure veg” – though you can have butter? Except I’m pretty certain it’s margarine. Veg curry and some sad soggy pancakes. 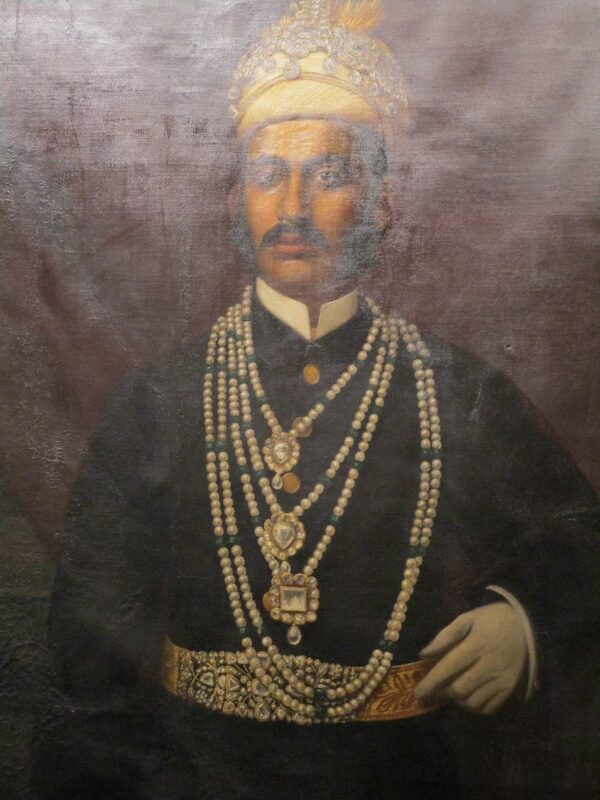 Chowmahalla Palace offers some prospect of interest, basically 19th century bling on a site started in 1790s. The first salon is a reception room that would do the Iranians proud. 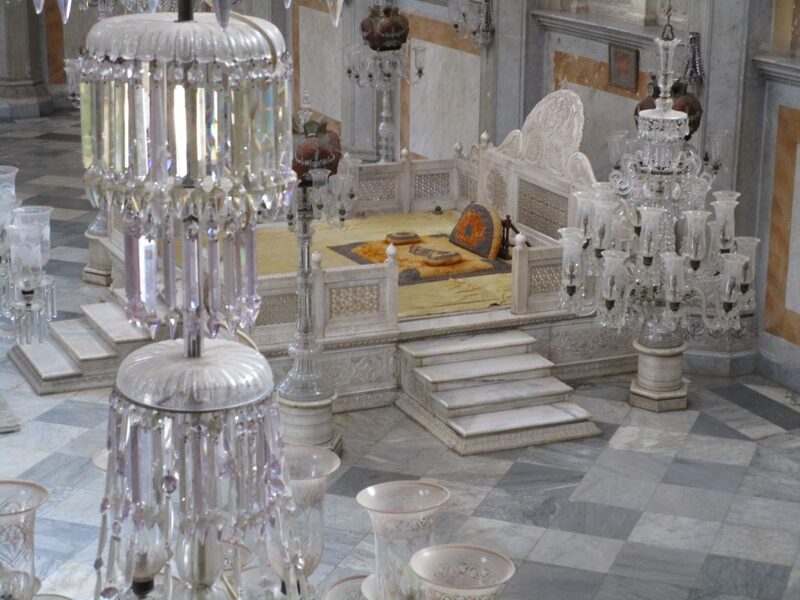 Cut glass chandeliers, mirrors everywhere and a comfy divan. 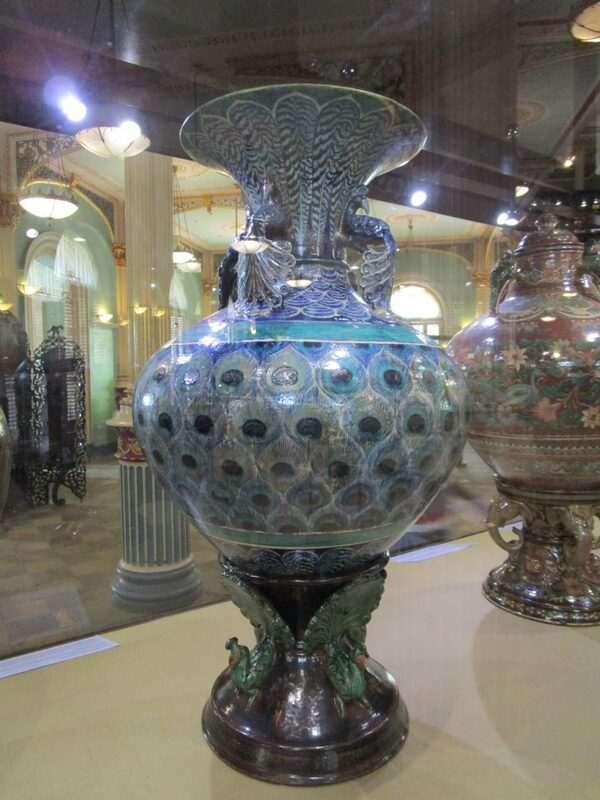 There are rooms of pottery from China and Europe and quite a bit from Staffordshire. No Chelsea or Worcester, just solid blue on white Stoke. And what looks like some large special pieces of Minton polychrome majolica. Bottle out of picking up a large jardiniere. One room has a fine collection of manuscripts including some miniature qurans. You look at them and marvel. A brush with two hairs? Lots of rusty armour on display. They had small hands judging by the hilts. And the shields barely 15″ diameter. Speed and skill. Curious spears that would be good to fish with. And the odd French crossbow. 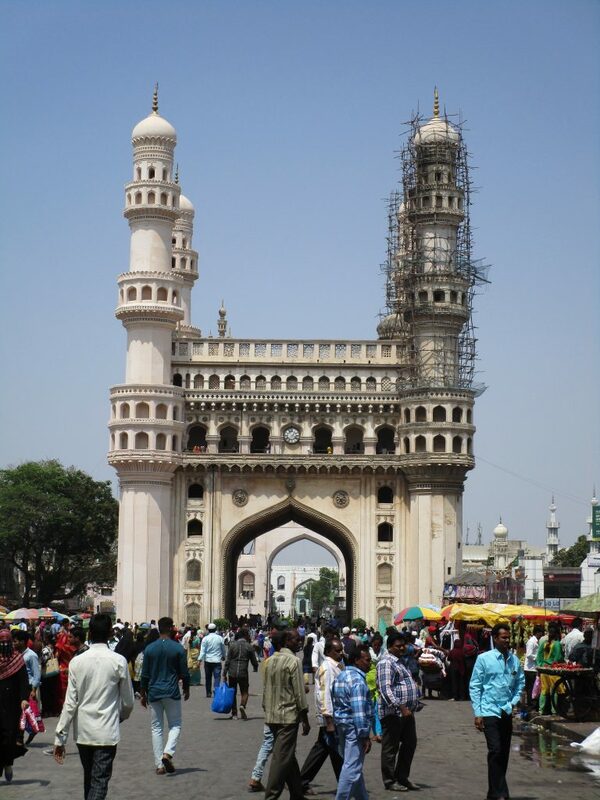 Not far away is the Nizam’s museum. This is devoted mainly to all the gifts, mostly silver, that he received for his 25th jubilee in 1937. What do you give to one of the richest men in the World? Who wrote the thank you letters? There is some correspondence between him and various British diplomats that reveal his elite education in England. There’s a good section on the city itself that is better informed and well written. As I’m leaving it I appreciate why. Man of sixty, good English asks me what I think. When I compliment the good labelling and language he is delighted as he is responsible for it. We talk for some time about the state of the city, politics currently in play and formation of Telangana State instead of Andhra Pradesh. . This is a murky tale of personal ego and power on the part of one individual who had it set up so he could be the boss. 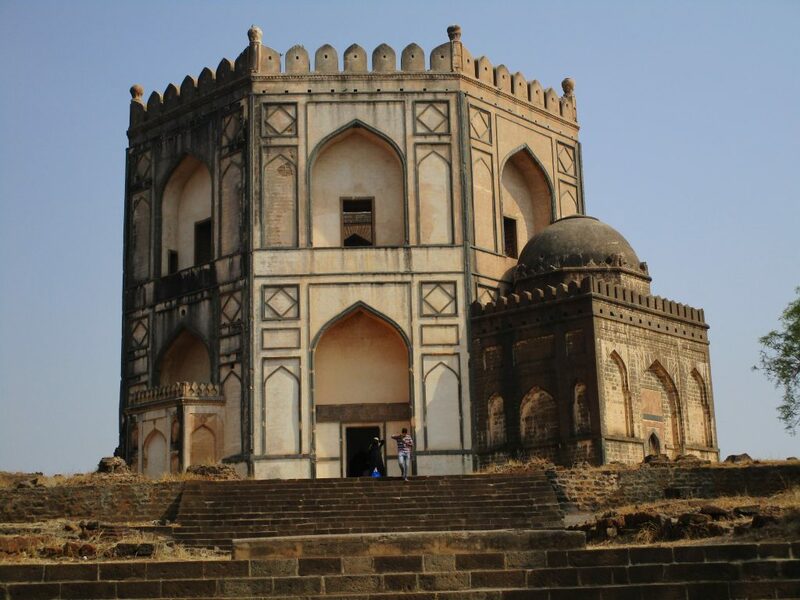 Char Minar is a small trundle down the road. Another Muslim monument, this time to celebrate ( the end of) the Plague in 1691. Unfortunately two of the elegant towers are covered in scaffolding. It’s been pedestrianised as far as anything here is and is a milling whirl of stalls and street vendors. Back at the hotel, comes the reality of the WiFi. Although the signal is fairly good, speed is not and it constantly drops out. I’ve come back to watch 5th ODI India/ Australia having been told in the morning it’s on Ch 403. Its not, this is not available I find it on a free chanel, 419, but it won’t connect. The IT bloke comes over fiddles about and announces they have been having a technical hitch recently. As it turns out eventually their hitech skills are on a par with India’s cricketing. Someone has said Bawarchi is better than Shadab for biriani these days so tuktuk despatched. When we pull up at Karachi Bakery it is clear he doesn’t speak English after all. Drives aimlessly for a bit then asks someone. We arrive somewhat later. His request for extra fee is politely declined. Mutton biriani is rather dry and the meat very spicy. A lot of rice and not much else. Think fondly of delicious plovs I had in Tashkent. Glad I ordered a sweet corn soup as well. Wherever I go to eat I am the only white face. Is the food generally bad or am I being paranoid? I strained lefthand rib muscles coming with backpack on the train which, combined with the hacking cough, makes for a painful combination. 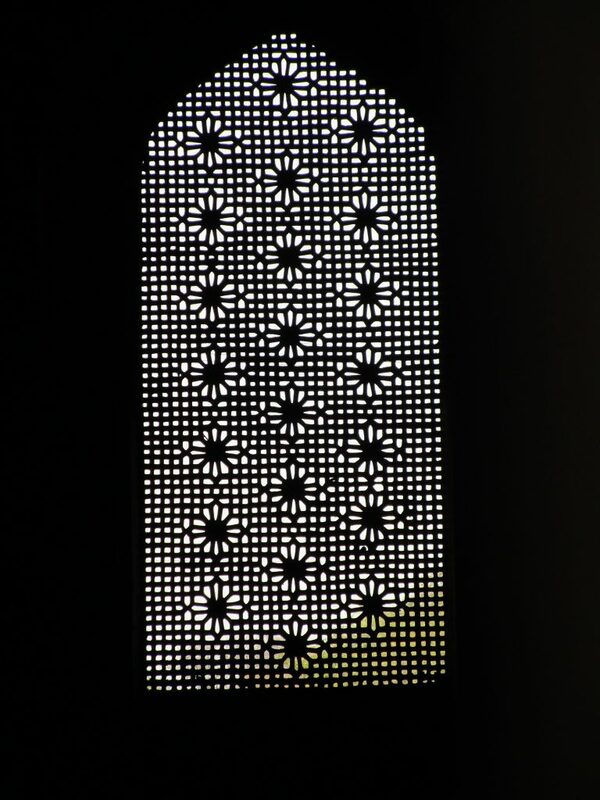 Treat myself to another coffee bag and some fruit for breakfast and make an early start for the Bahmani tombs on the outskirts of town. For a change the tuktuk driver is not surly and seems keen to show me stuff on the way, like the remains of what was once a huge madrassa. 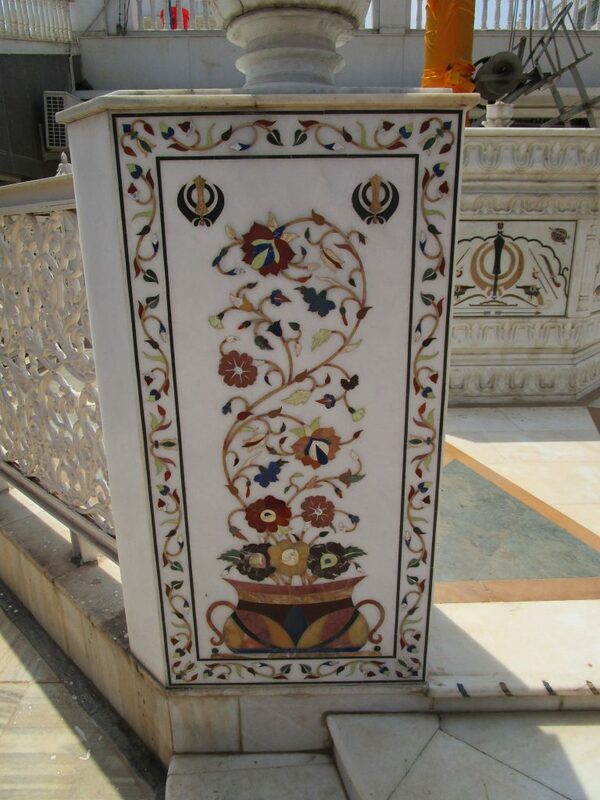 The tiles are polychrome, and most of them have been vandalised by ardent Hindus or suffered the passage of time. Out into the countryside and the tombs are soon in sight. They are large heavy ponderous grey, I suppose these are suitable qualities. Yet again, in poor condition, some are open only because inside is littered with building materials or else the doors are bolted and barred. The largest is accessible by squeezing through the gap. Another has a wonderful carved stone window that I can just get to between a gap forced between the doors. The tombs are covered in green clothes, as you would expect, but then they are tied down with rocks and rubble at the corners. You have to wonder who if anybody cares about them. 500m away is a separate shrine/tomb for a wife which has a different atmosphere. Rather than head back I ask to go to the gurdwara. 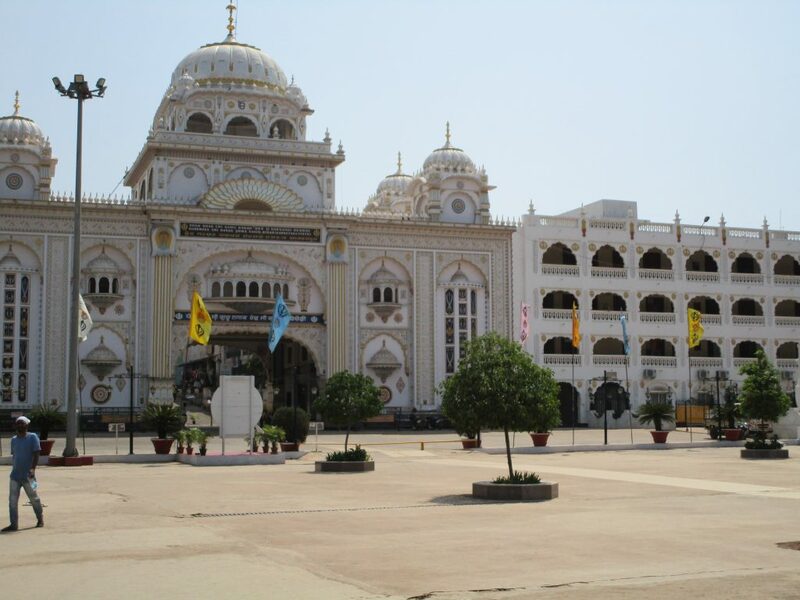 It was built in 1948 as a shrine to an important Sikh guru who had visited the area at the beginning of Sikhism. 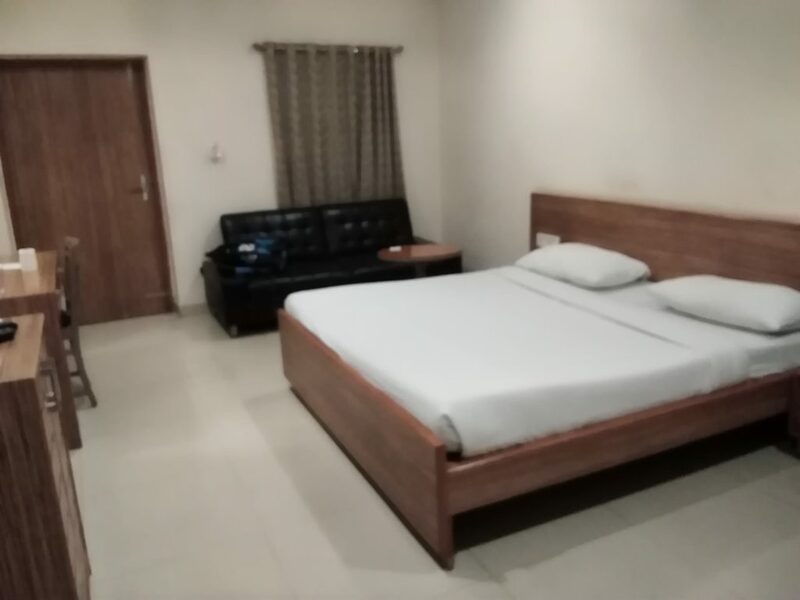 It is a large flamboyant very clean site on the outskirts. All rather like the Raymond Briggs style Sikh who is arriving at the same time. Name is Gordon, well so he says. His questions and offerings quickly establish a common link of Leicester. He’s lived there 12 years, having toiled previously in the brickwork in Bedford. He’s now 60 and happy to be able to grow his beard and wear the kris. He takes me under his wing and guides me through the protocols of Sikh shrines. Quite a lot of feet washing, no shoes, head covered–my Panama will suffice- and donations here and there. It’s all marble and tiles though the water can make it slippery on bare feet. He asks me if I want to eat langer. My first thought is “monkey”! But then I recall there is an enormous pilgrims’ kitchen. You get a sort of dal and rice thali with chapatti and veg korma. Again this is not a western style korma but not totally chillied. He then takes me in to meet the site manager who is an elderly charming guy who has been in post twenty years. I suspect it is not a particularly taxing job. Everyone is well-behaved and all is in order. Gordon makes enquiries about rooms and we say goodbye. He is going off to see the rooms so I thank him profusely and head out. The visit would have been much less without him. Need to pack for train to Hyderabad. 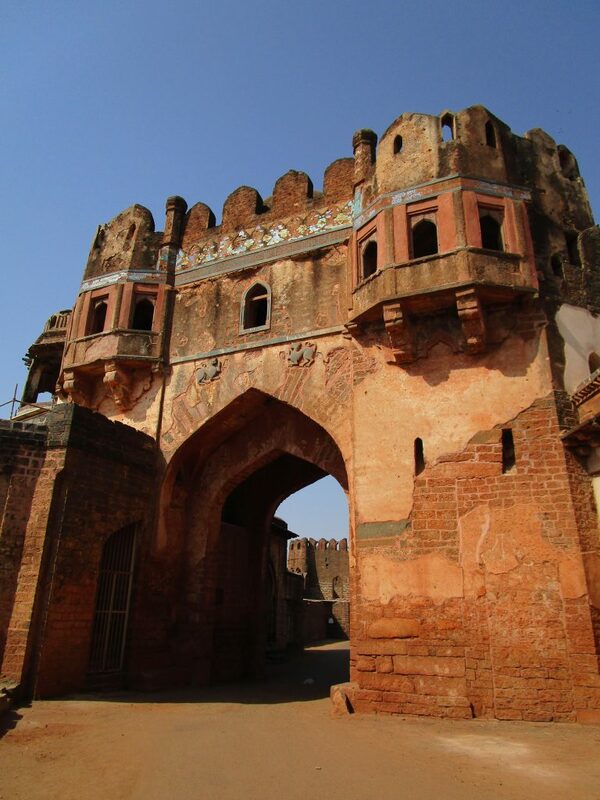 The train starts in Bidar which facilitates boarding and leaves bang on time. It is almost empty. Only fiddle is GPS is not registering but time and a big city should tell me when approaching Secunderabad. More passengers do get on- chap opposite wil not arrive till 4.30am. Sleeper means three layers of bunks and I have entire bottom to myself. It arrives 10 minutes early and a tuktuk has me at the hotel by 10.30pm. 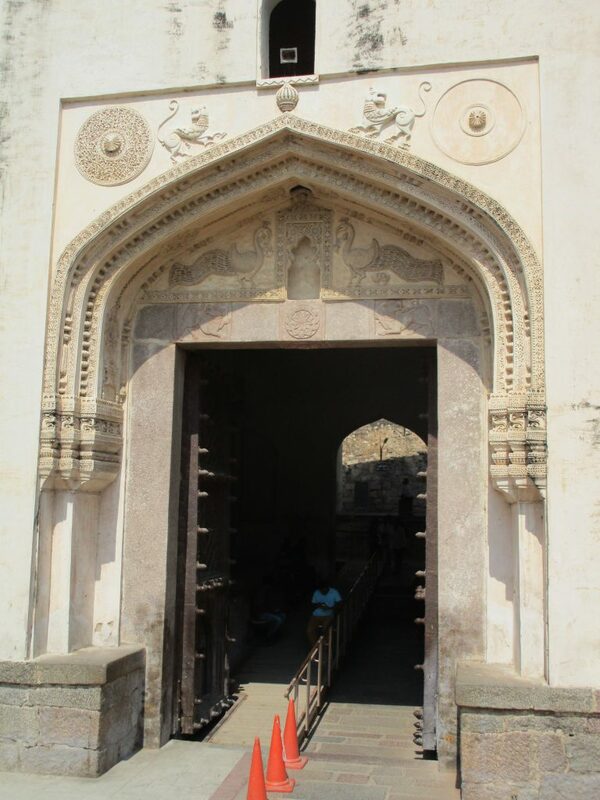 Room is large and clean and I have an overwhelming sense of relief at leaving the grimness of Bijapur and Bidar. Apart from the two French ladies, I haven’t spoken to a white man since saying goodbye the the tour party on 2nd March. Manage to extract a kettle for the room which means proper coffee. The Fort is not far away but the entrance looks like it is rather uncared for. Bit of a trend developing. The site overall is enormous. We drove along at least a mile with the walls on our side. 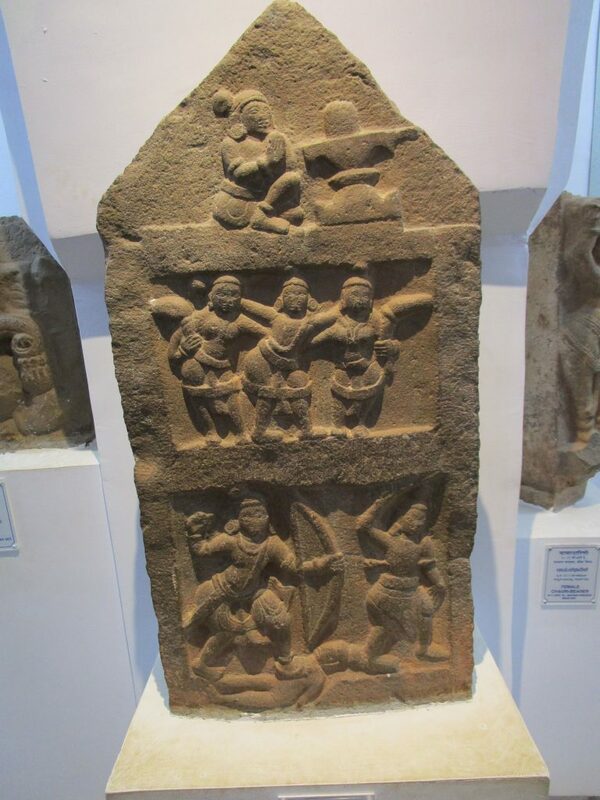 There is a small museum with interesting carvings but nothing about the site layout or where the various buildings are. 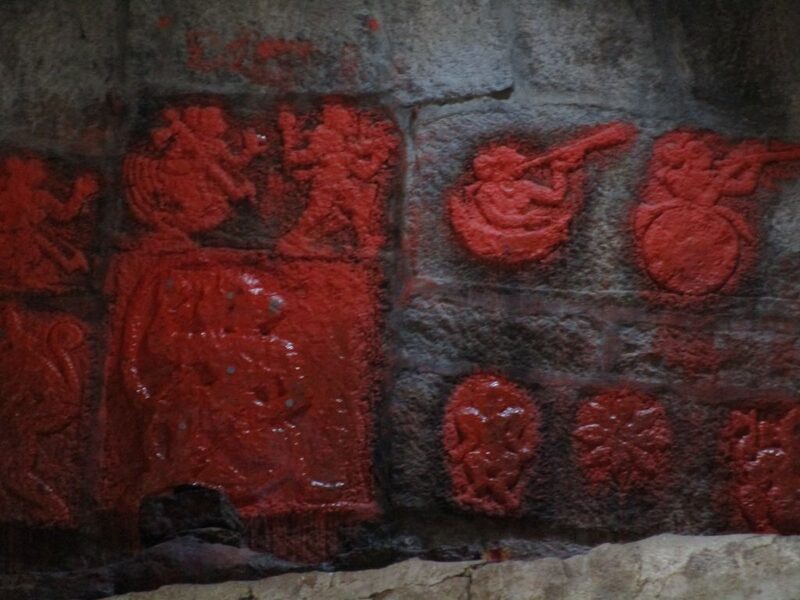 These stone depict scenes of everyday life and are a valuable historical source–here praying to a lingam, dancing and shooting people . Sad because there is little signage and most of the buildings are locked for no apparent reason. 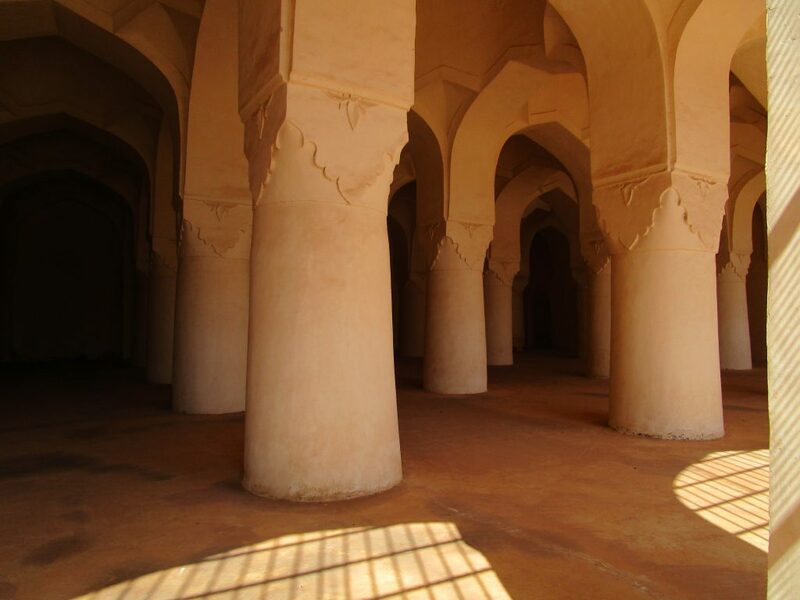 The mosque is large and solid with rows of big heavy columns. Locked and barred though visible through small breaches of the chicken wire. And that is virtually all there was to see. The Throne Palace had obviously been a very long time locked and others on the list were just nowhere to be found. 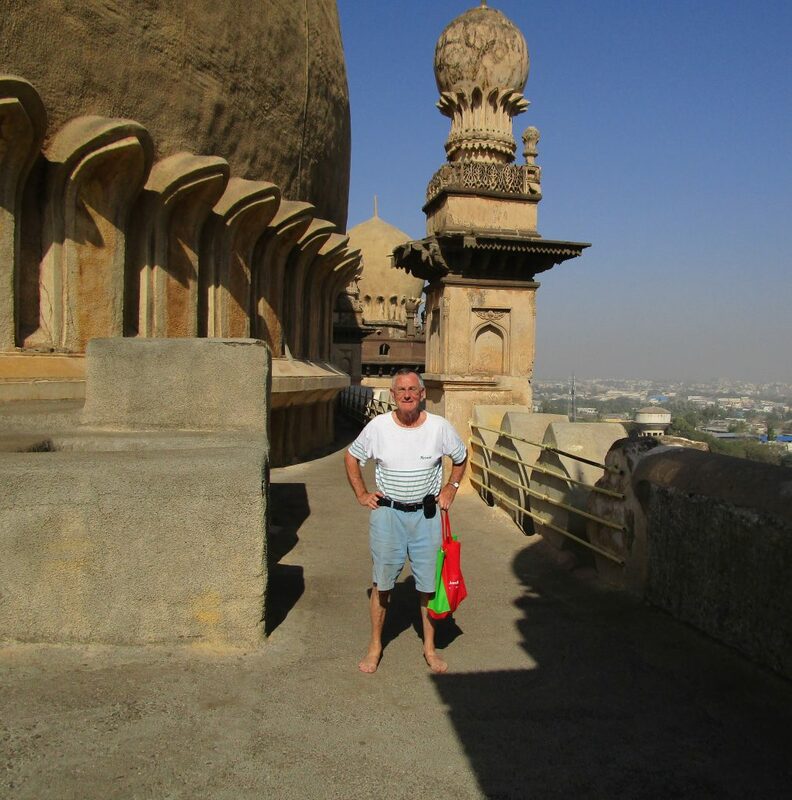 Wandering out in the great dusty expanse of the Fort as it became hotter and hotter was not an attractive proposition. I did spot a couple of good sherds, one with red slip decoration the other the rim of a pot with a flange for tying on a cover. Fell into conversation with a young couple who both spoke excellent English. They had driven on a scooter from Hyderabad for the day. Well-educated, well-heeled, totally unlike everyone else I’ve met in Bidar. I’ve actually had people glaring almost threateningly at me. They were heading off to the gurdwara and I to the old Clock Tower down the road. 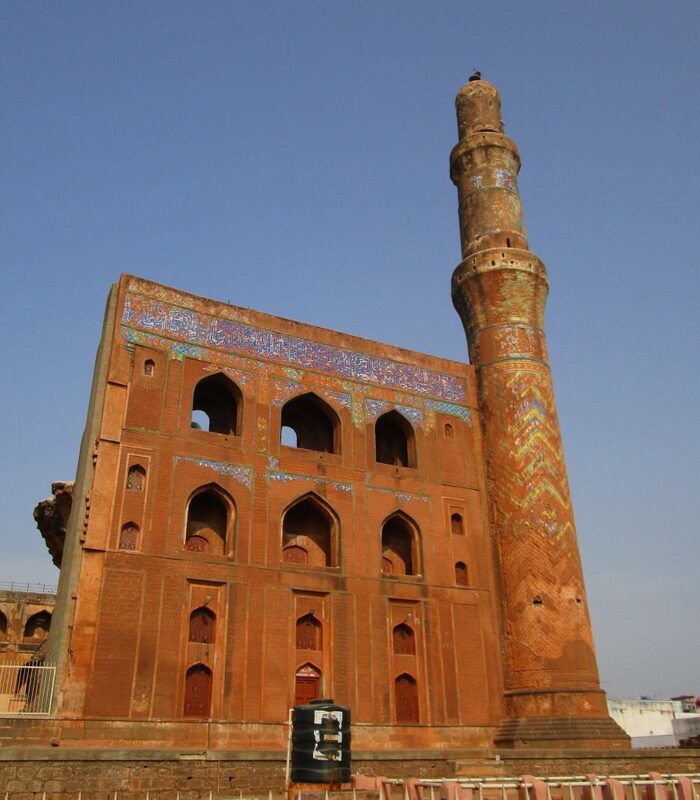 It’s a large round fat Islamic brick chimney, now with a clock perched on top set in the middle of a crossroads . You can’t climb up it anymore. Head back to the hotel before it becomes too hot but not before acquiring watermelon and bananas. It’s operating at about 800 C, resting on a wooden floor. Charcoal heated with a pump attached. I go over afterwards and speak to father for a little. He is obviously proud that his two sons are following him so successfully. Feeling that I have actually achieved one of the goals set before coming out here. It was a reason for coming to Bidar. What I hadn’t appreciated was how heavy the vessels are, thickly cast and not always to a good standard. Limited what to buy. I haven’t had a proper meal since Friday so lonely planet recommendation for a place down the road has me all geared up. Its a bit of a dive, dark drinking den and signs everywhere saying 5.5% service which is new. Eventually get a boy who speaks English and explain I want a veg korma not spicy and egg biriani. When it arrives the biriani appears to have been made yesterday and the korma is red hot with chilli. Get him back and have discussion about the inherent nature of korma ie mild definitely not spicy and didn’t the chef understand when you told him not spicy? Goes away and comes back five minutes later and offers me a taste of version 2 on a spoon. It is boiling hot, like you get from a microwave and I have to spit it straight out to avoid damaging my mouth. In fact I realise later that I have scalded my gums at the back of the incisors. Manage to remember sister’s birthday and that’s about it. Bedroom has a fascinating ceiling. 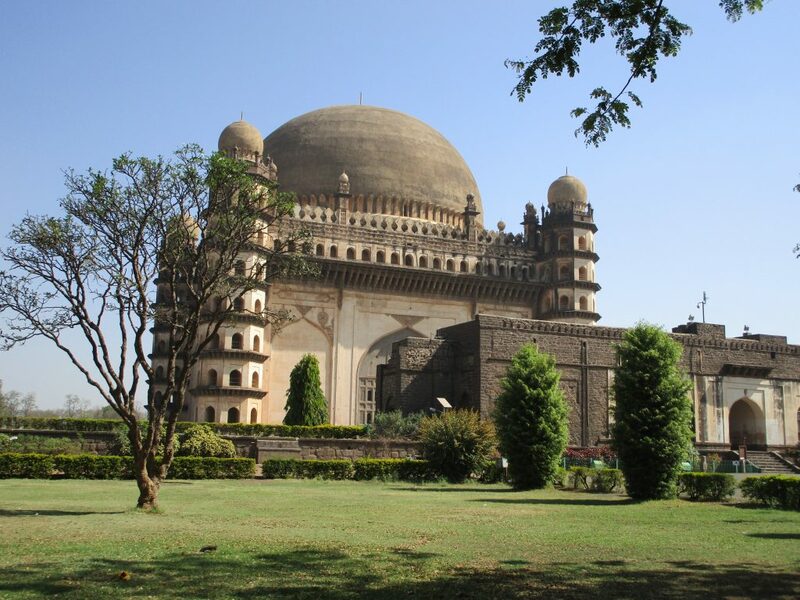 Get up at seven as apparently it is better to go to Gol Gumbaz ahead of the crowds. Breakfast is papaya and a couple of fried eggs. No bread no coffee. Same walk down the bypass to pick up a tuktuk into town. The monument is huge. Described as being the largest dome in the World after St Peter’s. 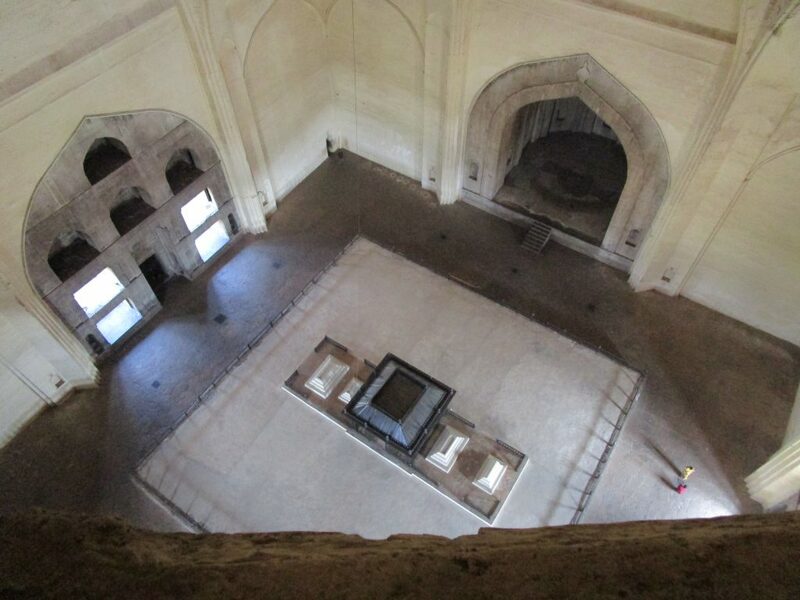 Inside is very stark and grey, quite different from the mausoleums in Turkey or Iran. He went to such lengths to have a lasting memorial and all people come for is to make noises up in the dome. 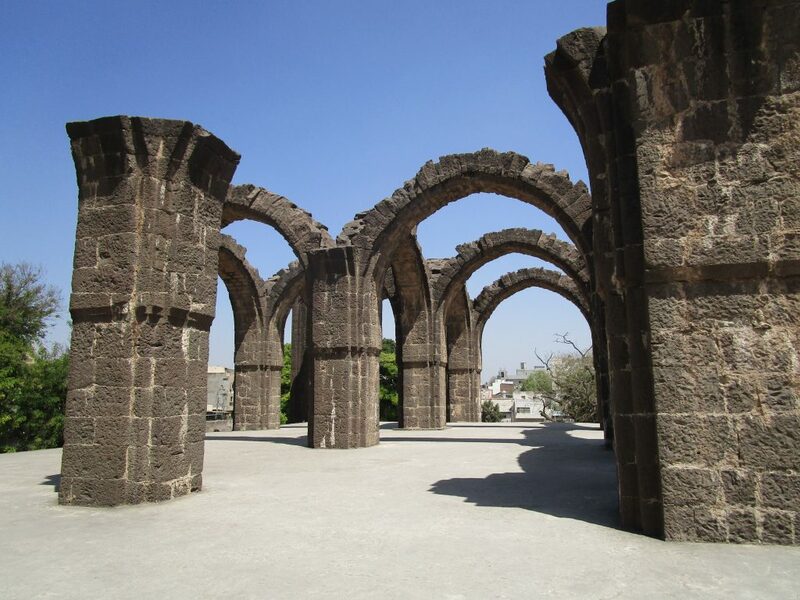 The dome itself is accessed via the four towers on each corner. Each step is about 9″ high and roughly hewn. Coming down will be interesting. Again it is totally without ornamentation. There is a recurring echo ten times around. There are just two Indian boys up there. I can see why to avoid the crowds. Looking down makes you appreciate the scale of the building. There’s a chap at the top whe tells you which tower to go down on a one way system. He offers to do me a “selfie”. Going down, barefoot, is slow. The passage is narrow so the lack of a handrail is not so serious. As I leave crowds are pouring in. Phew. This is Bara Kaman. 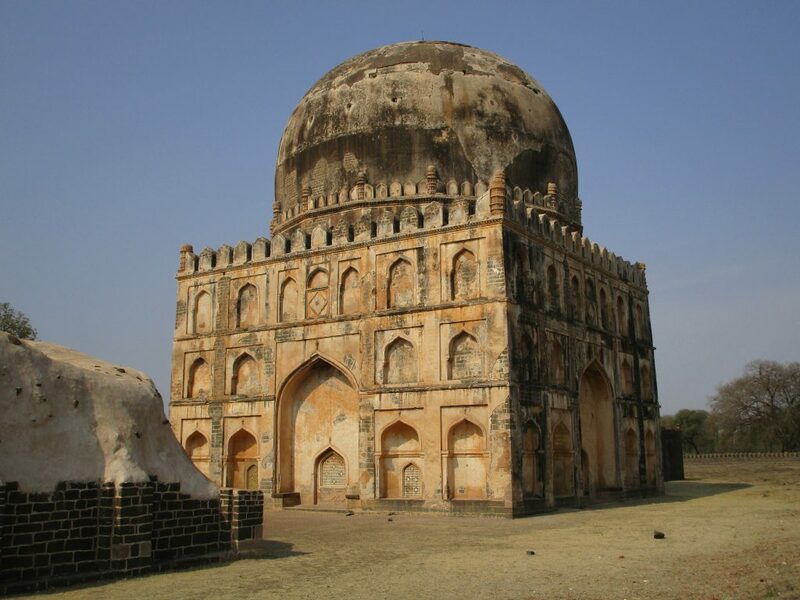 It was due to house the remains of the son of the man who built Gol Gumbaz. But dad murdered him and knocked down most of the arches in case they threw a shadow on his place. Makes Henry VIII and monasteries seem like a vicarage teaparty. Again totally deserted. And an eerie unloved feel. Karnataka is Congress territory but still there is a suspicion that all this Muslim heritage is uncared for. Makes me think of Armenian Ani in NW Turkey. It’s pretty hot-35 in the shade and….. – so decide to head back to rustic idyll that is Sabala. The conflict there is you have to be close to the office to get WiFi. Nothing is perfect. Fix up a tuktuk to take me into town in the evening and wait. Food is OK but not remarkable. Portion control is the biggest problem. Too much for one person. Five Russians walk in to the A/C saloon. Portions will suit them! I wait to see if they are staying-its pure veg and no beer- and when they start to settle I offer to change table as I am at a six. Idea dismissed not even a thank you from the big guy who is obviously the guide. Bloke my age goes out for a fag and the Boss soon has the three women in stitches. Wonder where it will end.